Quick snack ideas are much appreciated, well, anytime. I was going to say during the busy time of year, but isn’t the whole year busy? Honestly, I always reach for quick snacks. I can’t remember the last time I spent a lot of time preparing snacks. Dinner is one thing, but I don’t spend time on munchies. The key is to grab quick items that aren’t horrible for you. Sponsored by Linqia. All opinions are my own. I have a huge sweet tooth. You can put a full bag of chips in front of me, and I am fine but bring me a pint of ice cream, and it’s over. Consequences mean nothing to me when it comes to ice cream and sugary goodies. Knowing this, I try to find healthier alternatives to satisfy my cravings. I am not forbidding anything from my diet because I know from experience that is a recipe for disaster for me. Instead, I focus on moderation and substitutions. For example, my sister and I got into a bad habit of eating candy in the office. When I go to the office at her house, we have a bin of snacks. During the afternoon slump, we would grab candy for the quick sugar boost. Now I associate the office with sweets and crave them as soon as I walk through the door. Oops. 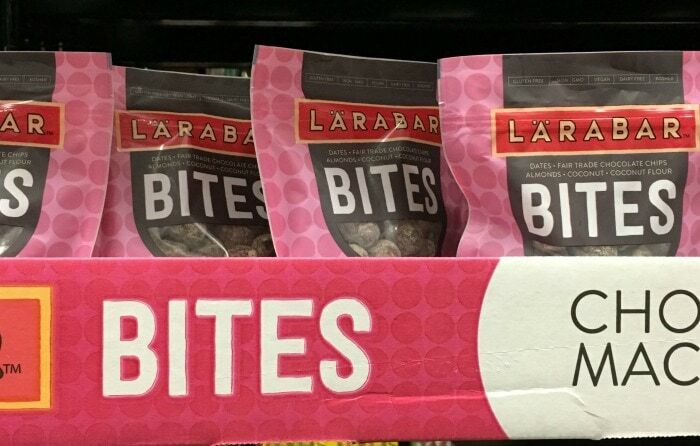 We restocked the bin with an assortment of Lärabar® products. Their Original Fruit & Nut Food Bars are made with only a few, recognizable ingredients, are minimally processed, and GMO-free. They are still sweet enough to not feel like a sacrifice, and they are way more effective at providing energy without the sugar crash. Another vice of mine is ice cream. I crave ice cream every single night. It’s an addiction-like craving that takes over my thoughts until I cave. A tasty substitution is a yogurt parfait. 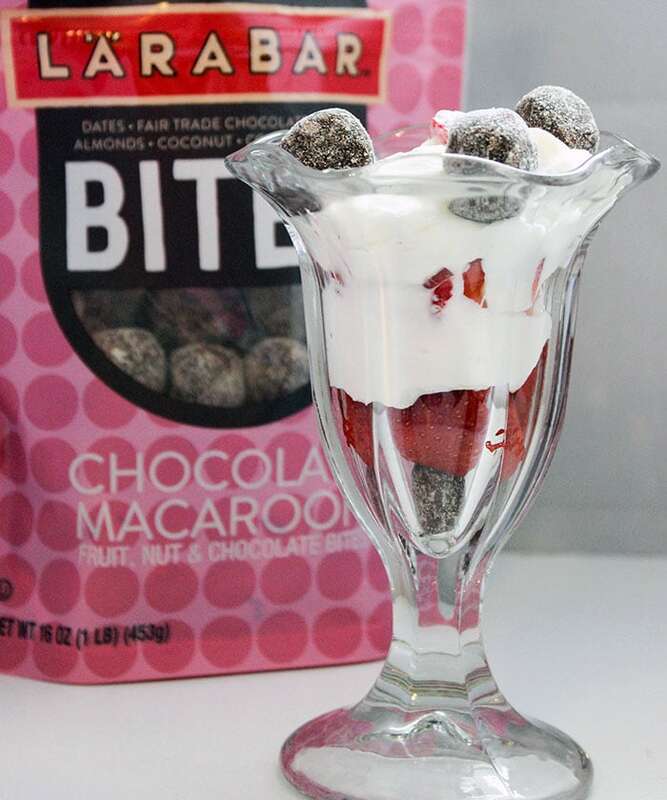 The new Lärabar Bites Chocolate Macaroon are perfect for parfaits. They are amazing on their own, too, but I am super hooked on them in a yogurt parfait. To make the yogurt parfait, I layer fresh strawberries, plain Greek yogurt, and Larabar Bites. It’s still a quick and easy snack with only three ingredients. Sometimes I put it in the freezer for a bit, so it’s more of a frosty treat. Sometimes I even eat the parfait as breakfast. 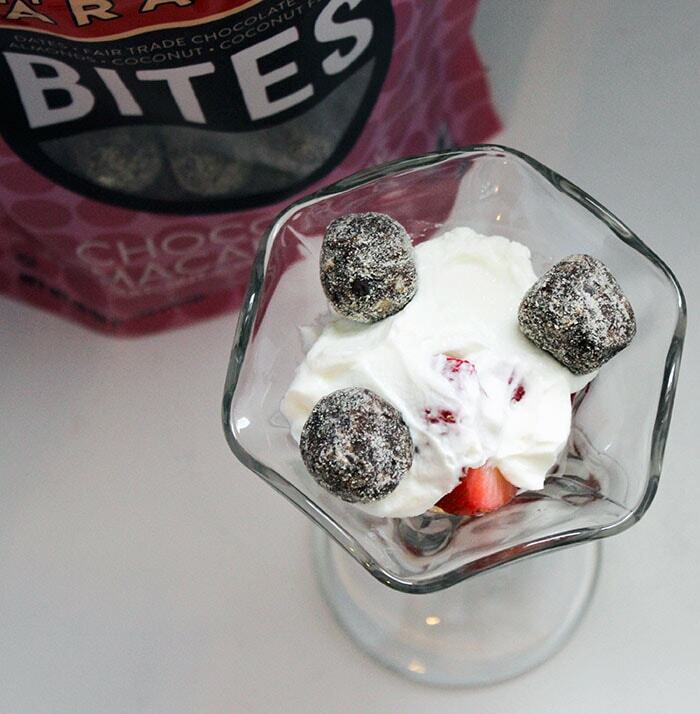 That’s the beauty of creating healthy snacks – you can eat them anytime without feeling crappy afterward! >>> Visit the Lärabar website to learn more about the products. 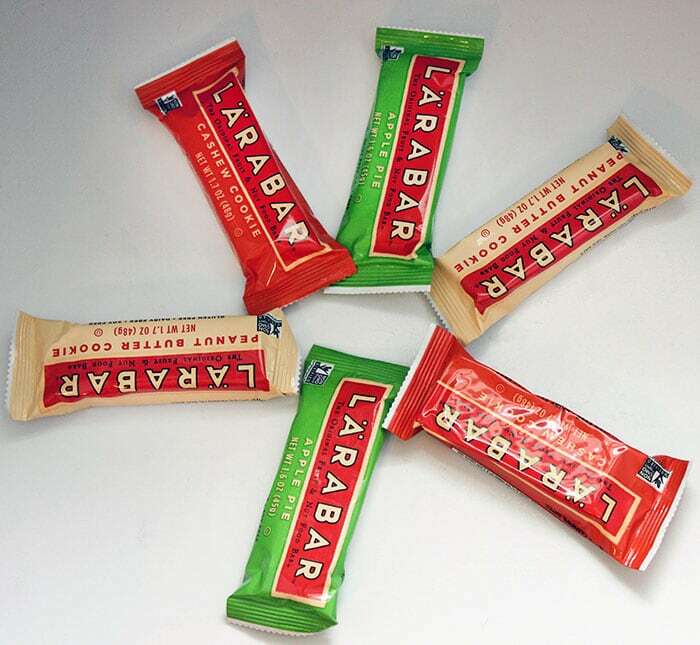 >>> Share your simple foods to Instagram using #Lärabar for a chance to be featured. What are your favorite quick snack ideas? These are really great snack ideas. Too much sweetness can affect the body homoestasis and this might pose some risk to one’s health. Thanks for sharing this health snack ideas. 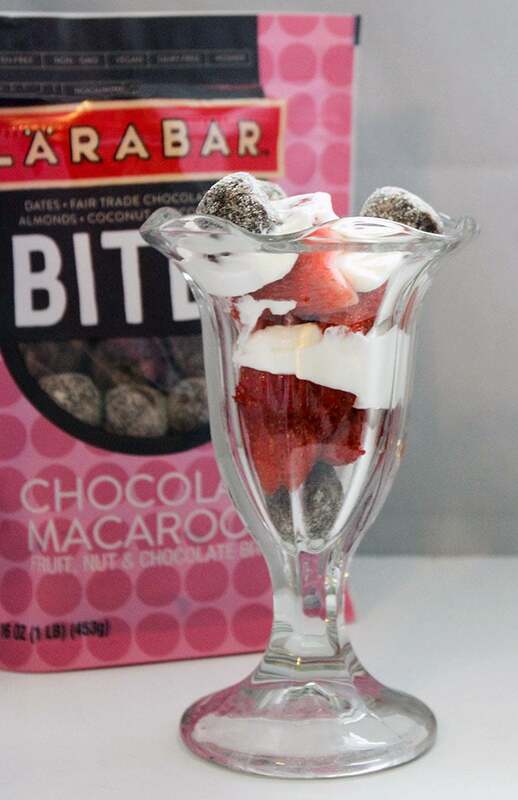 I love Lärabars and I want to try the Lärabar Bites Chocolate Macaroon. I do like the idea of a yogurt parfait! I haven’t tried the bites but now I’ll look for them next time I’m at the store. I’m the opposite: chips – gone; sweets – take or leave. I like the Larabar line of products and I can see how they would be able to satisfy my craving for sweets. I LOVE that dessert! The best way to ease the sting of staying away from sweets is to switch to something that seems like a favorite sweet. Thanks for sharing this recipe. 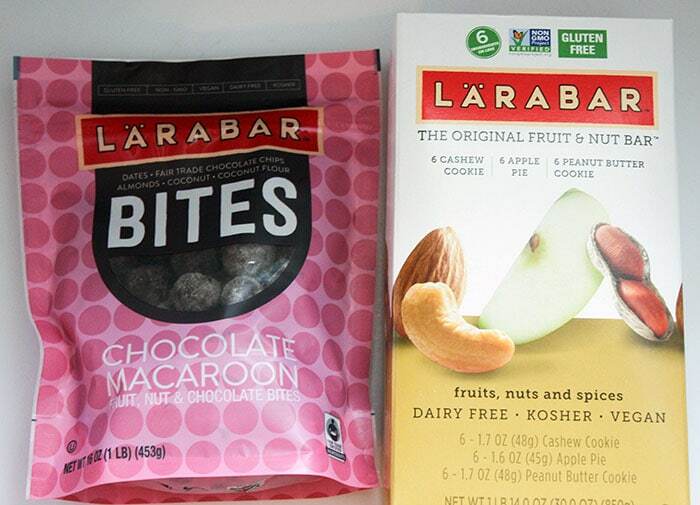 I have not tried the Larabars yet but I love how they are dairy free! The chocolate macaroon sounds delicious. I bet my kids would love these in their lunch boxes. 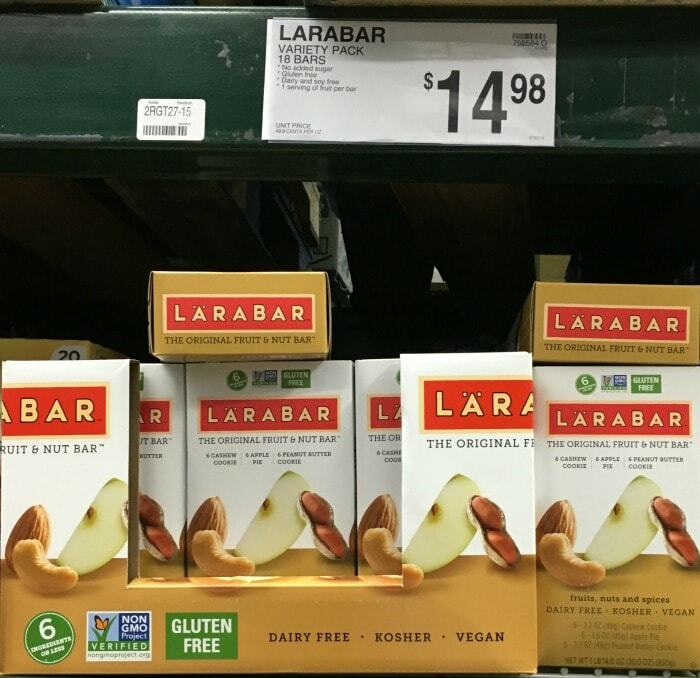 I had no idea that Larabars are vegan!! These sound like a great way to avoid unhealthy snacks and stay on track! What an interesting dessert idea to avoid sweets. This is really neat, I will have to give these a try. Never seen them before, wonder if my local shops carry them! I love lara bars. They get tossed in the gym bag regularly for a post workout snack! I think we all crave that mid afternoon sugar hit – but our office is also trying to rid itself of the sugary treats. I have never tried any Larabar products before, but these look like great snack options. I would love to try the fruit and nut bar. I will have to keep an eye out for the Lara bar bites. My go to is fruit. If I have some homemade goods like muffins or granola bars I grab those too.